It’s pretty simple to look good on-screen. You have a whole team of costume designers, hair stylists and photographers whose entire job is to make you look excellent. Off-screen, you’re on your own. While a lot of off-duty actors tend toward the dull or bizarre (see: Johnny Depp), some manage to maintain their movie star cool in impeccable outfits. We’ve narrowed all of cinema history down to nine perfectly dressed men. These are the best-dressed actors ever, with some insider tips on how to steal their style, if not their A-list handsomeness. The gold standard of smart-casual. Poitier wore a suit like he was born in it, but his real strength was in-between dressing. A shirt and tie with a cardigan thrown over the top, or a subtly coloured shirt with a crisp blazer. The thing that made Steve McQueen so stylish is that he always looked casual, whatever he was wearing. “That makes him the epitome of classic chic,” says stylist Suzie Street. Whether he was in a jeans and a T-shirt, a polo and blazer, or a three-piece suit, he wore everything like that was the outfit that was most comfortable for whatever his day held. His look wasn’t crisp, but rather everything looked like a trusty favourite he’d pulled from the wardrobe for the umpteenth time. Though crucially, none of it looked tatty. To get the look, keep one part of your outfit just a touch disheveled. Team an old denim shirt, with sleeves rolled, with clean, slim chinos and desert boots. Wear a sharp tweed jacket over a single-colour sweater you’ve had for years, even if the neck has stretched out a bit. If it’s all pristine it’s not McQueen. Delon is the quintessential effortlessly stylish Frenchman. His is a style that’s very hard to emulate because his clothes are doing none of the work. Nothing he wears is unusual, just simple shirts in staple shades, light-coloured chinos or a neat grey suit. The style comes from his comfort in them. To try to get the look you kind of have to stop, well, trying. “To obtain this look, don’t be too forced,” says Olie Arnold, style director of Mr Porter. “The more you overthink it, the more forced it’s going to look.” Stock up on menswear staples like a blue linen shirt, unstructured blazers and some investment sunglasses. He’s almost always formal, from exemplary black tie to more casual takes on tailoring like unstructured jackets or patterned separates. And you can see that he’s put thought into every detail. This is the opposite of effortless style. He really tried and he got it right every single time. Redford’s peak was the seventies, his shaggy hair and big sunglasses era. His manly casual look is a very easy one to copy. “Robert Redford wore his casual looks loosely, so that they were never tight to the body,” says Arnold. “Not only did this allow movement, it also left him room to layer up, which is a rule I’d give to men wanting to emulate this look. “My advice would be to invest in a good overshirt, field jacket, a rugged pair of boots and some really well-cut jeans.” The Redford look works for any age, and the older those investment items are, the better they’ll be. Preppy is the word that best describes Newman’s style. His button-down shirts, light chinos and loafers are as all-American as you get, but he kept them from looking starchy by rolling his sleeves right up, wearing his shirts a little creased and usually adding some big, unpreppy sunglasses. It took the Ivy League stiffness out of it. Another key to making his look work, says Murray, is quality. “You can see his appreciation for natural, sumptuous fabrics.” Simple things look great when they are beautifully made. Hardly anybody came out of the eighties with their style credentials intact. Lots of actors looked memorable (Eddie Murphy in head-to-toe red leather; Michael Douglas in mega-shouldered suits; all the Brat Pack in variations on double denim), but few had a look that you’d want to copy today, unless for fancy dress purposes. Richard Gere may be the only man who left the decade sartorially unembarrassed (maybe Harrison Ford, too). Gere learned a lot of lessons from his breakout role in American Gigolo, for which he was dressed by Armani, and did a toned-down version of dramatic 1980s fashion. He still had the double-breasted suits, belted camel coats and stone-washed jeans, but with less exaggerated tailoring and no garish patterns. “He often wears his shirt unbuttoned and favours a larger collar,” says Street. He’s kept that simple-but-expensive-looking aesthetic into his sixties. The thing that Ryan Gosling is a true master of, though, is casual dressing. In particular, he knows the importance of three key elements: jackets, good knitwear and boots. 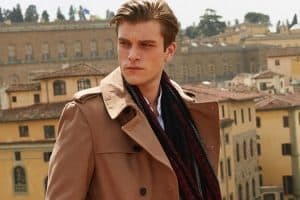 He’s mostly in some version of jeans or chinos and T-shirt, which every man has in his wardrobe in multiple variations, but he lifts them with a seemingly endless selection of really excellent outerwear – patterned bombers, battered leather jackets, peacoats in every colour – and sturdy boots. In recent years, he’s injected some X-factor with patterned knitwear, which shouldn’t work but always does. Those things together turn a thrown-on outfit into a look. Look at any photo of Glover on the red carpet and tell us he’s not the best formal dresser of all time. He looks good in the classics but he excels at pushing the envelope turning every shade of tailoring – brown, purple and orange included – into something wearable. Anybody can look good in black tie, with the right tailor, but it takes boss-level skill to take risks with formalwear and not look ‘wacky’. Oh, and when he’s not wearing a suit, his collection of statement jackets is outrageously good. No wonder he was our best-dressed man of 2017.